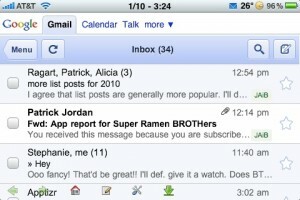 Recently iLegendSoft updated two apps that I have recently reviewed “ Gmail Push and their Mercury Browser. Of those two, one is a worthy upgrade, and the other I had deleted before the day was over so I could reinstall the older version. for those concerned with the privacy of giving out your Google credentials, there is now a Forward Mode which allows you to receive mail notifications (see instructions). Now the bad news: Mercury Browser 2.0 didn ‘t even make it a full day on my iPhone before being removed. What was touted in the upgrade was a ‘redesign in user UI, and download files management. ‘ What was actually added was a splash screen (see top), a Stop loading popup box, and different navigation buttons images, one useful ‘Full Screen ‘ toggle, and one useless ‘all-about-Mercury-Browser-Pro ‘ in the bottom right corner (see above). I have to agree with several of the latest reviews that stated that the free version removed certain functions (such as Private Browsing) and migrated it to a Pro- version that is currently unavailable in the App Store (and at the time of this writing, a 404 link on iLegendSoft ‘s website). Maybe I would have changed my mind with a little more time “ since I never utilized the Download Management feature “ but I was so irritated with the changes that I wanted my old version back. If you never knew what you were missing, version 2.0 is still a step up over Safari. But if you upgraded and are as disappointed (or not), let us know! Thanks – I think? – for how to locate the "pro" version. If it's buggy and has the same dysfunctional GUI I encountered with the free version, it's an unfortunate release before the app is ready.